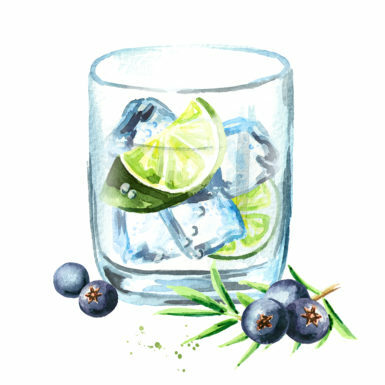 Gin in general can be defined as a distilled spirit with a predominant flavor of juniper berries, with minimum alcoholic strength by volume of 37.5 – 40.0 % ABV depending on country. Gin is made from neutral alcohol and various botanicals. Flavor profile and quality of gin will depend on quality of neutral spirit and type and quantity of botanicals used (roots, leaves, barks, fruits, seeds and flowers), as well as the method of flavoring: compounding, maceration or vapor infusion. Besides Juniper berries following botanicals are widely used in gin production: coriander seeds, Angelica root, orange/lemon peel, licorice root, cinnamon bark and many others. Compounding: Character of neutral spirit are distinctly altered by adding flavours either in the form of essences or botanicals themselves. No redistillation required, and can be filtered to remove solids and/or flavor. This product cannot be called “distilled gin”. Maceration: Soaking botanicals in spirit for a period of time prior to distillation. The botanicals may remain in the pot or all/some be removed before distillation. Can be used to produce gin with quite a heavy aroma. Vapour infusion: the mix of juniper and botanicals do not come in contact with liquid as they are hung in a basket above the liquid level in the still. When heated the vapour passes through the botanicals picking up their flavour. With this technique usually gin with lighter flavour is produced.